Just spotted the ring video doorbell 2 at amazon for £105.52. They also have the first edition for £89. The most annoying thing though is it only records 30 seconds, so often you’ll not see what they do with the package as the video has cut off. You cannot record locally to a router, obviously because they want you to subscribe. Im not impressed, I really think it should be 50 quid. Yes I have been waiting for a ring pro deal but thought for this price I will give the ring 2 a try as I can hard wire it also and features look ok. Will probably have a ring pro deal soon and will be kicking myself for not waiting. Should get hot thanks for posting! I knew this would get cheaper and cheaper now Amazon own the brand! 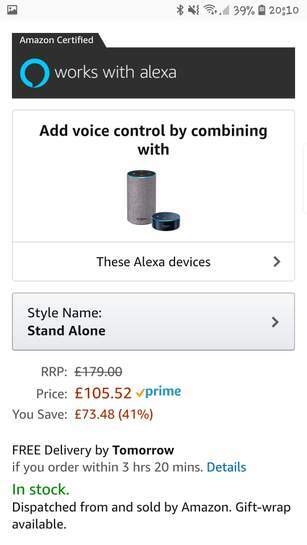 Sorely tempted now but I still feel there will be a new model out with much better Alexa Show integration so still holding off. But heat added for the deal, which is a corker! Not bad at all, going to hold out for the inevitable new Amazon models though. It has quite a few issues, for one there is a lot of latency between when …It has quite a few issues, for one there is a lot of latency between when you press the doorbell and get the notification. If you want a chime you’ll have to pay a fair amount extra, don’t think you can use your Echo as one...The most annoying thing though is it only records 30 seconds, so often you’ll not see what they do with the package as the video has cut off. You cannot record locally to a router, obviously because they want you to subscribe. Im not impressed, I really think it should be 50 quid. I have a feeling Amazon will be working on a much better one as we speak! . There will be clearly be much better Alexa integration because let's face it without Alexa they wouldn't have bought Ring in the first place! Bought it same price on Prime Now with 8% Halifax cash back. Heat. Ring 2 can be used battery or hard wired. Pro is hard wired only and has a better customizable detection zone. Pro is also supplied with 4 face plates and is narrower. Ring 2 comes with only 2 face plates. Pro also comes with transformer for fitting into a fuse box where the ring 2 uses the supplied rechargeable battery or your existing bell transformer. Ring 2 can be used battery or hard wired. Pro is hard wired only and has a …Ring 2 can be used battery or hard wired. Pro is hard wired only and has a better customizable detection zone. Pro is also supplied with 4 face plates and is narrower. Ring 2 comes with only 2 face plates. Pro also comes with transformer for fitting into a fuse box where the ring 2 uses the supplied rechargeable battery or your existing bell transformer. Great, thanks for info. Do people buy the chime box too or do they only use the phone? I guess I can add the chime box later if I don’t adjust to using the phone only. It also has 5 ghz (or 2.4Ghz) which is also of benefit as there is less interference. Great, thanks for info. Do people buy the chime box too or do they only …Great, thanks for info. Do people buy the chime box too or do they only use the phone? I guess I can add the chime box later if I don’t adjust to using the phone only. I am going to hard wire it to my existing bell and hopefully that will work as well as alerting my phone. May add a chime in back room later if needed. A few Ring Doorbell 1 720p available on Amazon. Idiot moderator wouldn't let me post as a deal. Ring Doorbell 1 - £55A few Ring Doorbell 1 720p available on Amazon.Idiot …Ring Doorbell 1 - £55A few Ring Doorbell 1 720p available on Amazon.Idiot moderator wouldn't let me post as a deal. Does it allow for recording of motion detected (even if very briefly) without subscription? Must be a new one coming out ... with range and faster capture! I hated the Ring 1, thought it was absolute trash. Thankfully my box had the misprint on it so I got the Ring 2 free replacement. Video quality much better now. However, a few times someone has pressed the doorbell and my chime or notification hasn't worked. I look at the doorbell and it just has a spinning blue light on it. Press the bell a few more times and then suddenly it works. A bit annoying as I've missed a couple of deliveries now! Seems like quality is much better than Ring 1 but is a lot more unstable!! Yes. Managed to nab one at £55. I have a feeling Amazon will be working on a much better one as we speak! …I have a feeling Amazon will be working on a much better one as we speak! . There will be clearly be much better Alexa integration because let's face it without Alexa they wouldn't have bought Ring in the first place! Yeah me too, got some Yi cameras and I wish they'd release their own doorbell so it's all In the same ecosystem. I used to sell these and wouldn't bother yet. Integration with Alexa is pointless right now,how difficult to get Alexa to tell you someone is there?? The delay is rediculous and the quality not great it also really needs hard wiring. 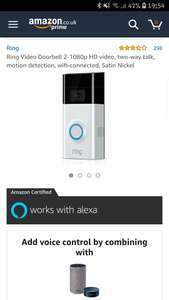 Hopefully Alexa can act as the doorbell also. We have the first version, (I'm often bed bound so I use it to check on my kids in the park outside on my echo show) it's not too bad. You can only ask the show to show you the doorbell with the first edition, it doesn't pop up like it does on my phone. Didn't need the chime ringer, as I have dogs who can hear it and they make enough noise each time! With Ring you control your doorbell from your phone! Quite a catchy jingle that. They should use it. I hated the Ring 1, thought it was absolute trash.Thankfully my box had …I hated the Ring 1, thought it was absolute trash.Thankfully my box had the misprint on it so I got the Ring 2 free replacement.Video quality much better now. However, a few times someone has pressed the doorbell and my chime or notification hasn't worked. I look at the doorbell and it just has a spinning blue light on it. Press the bell a few more times and then suddenly it works. A bit annoying as I've missed a couple of deliveries now!Seems like quality is much better than Ring 1 but is a lot more unstable!! I did the same and got a ring 2. I also had that issue you described, I swapped my talktalk router out for a decent Asus one, reset the ring door bell and connected it and its been fine ever since. Back to £149 for me. The adverts annoy me because what delivery service is going to say oh we left it in a safe place as the doorbell told us too... That just opens themselves up to claims of 'missing parcels'.